How often have you set a goal, felt excited and ready to rock, only to discover a few weeks later that you feel worthless, miserable, and just want to lie on the couch, watch movies, and eat chocolate ice cream? Probably more often than you’d like, right? We all go through the same ups and downs. Freedom from this suffering comes through the realization of what it truly is. And that is exactly what we will be covering in this article. This isn’t your ordinary goal setting article. I will be looking at goal setting from a big picture view, and how you can listen to your inner compass to make progress that not only is fast, but feels right as well. How we think about our goals very often has no bearing in reality. And the way you feel about your goals is no indication of how likely you are to reach them. The reason you feel like your goals are unattainable is because you cannot imagine what the path will look like. You cannot see, or sense the steps you need to take to reach the finish line. This is why taking one day at a time; one step at a time is powerful. 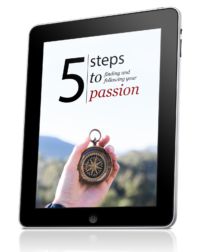 When you’ve found your passion, and have started on your journey to a more fulfilling life, you will run into many obstacles, and you will be tested. You will feel like giving up. You will curse the gods for delivering all these impossible challenges to you. But you will keep going, and you will overcome the challenges. My way of goal setting is much more holistic than most. I frequently talk about this with my coaching clients. The truth of the matter is that you do not have to know how things are going to unfold in order to get to where you want to be. Now, this doesn’t mean that you do not break complex tasks into smaller pieces. It means that you accept that where you think you will end up might not be anything like where you will really end up. I struggled with this for many years. I tried forcing myself to go down the wrong path, because that’s what I thought I needed to do. It wasn’t until I let go and started listening to my heart, intuition, gut, higher self, or whatever you wish to call it, that I started experiencing synchronicity and flow in my life. You see, what we overlook is that the goals we set for ourselves might not even be what we truly desire. When you allow your goals to be flexible and life to guide you, well … your life becomes effortless. This does not mean it will be free from suffering, challenges, or pain. It just means that you will be led to where you need to be, when you need to be there. There’s a lot of information out there on how to set goals, how to plan for them, and how to push through obstacles. Very few people focus on the big picture. Most go after goals they do not care about, and they end up quitting because it’s just too hard. When you have enough internal drive, when there is no other option, you will get there despite all the challenges you run into. It’s almost as if something outside of you is pushing you on. You feel like you’re on the right track, and you couldn’t give it up for anything in the world. Those are the kind of goals that are worth pursuing. Instead of leaving you hanging, I’m going to share my personal goal setting process, which is very simple, and not something I even call goal setting. Listen to your heart. What do you really want? And by really I mean really. I’m not talking about getting a nice car, a big house, or a bucket of shiny gold coins. I’m talking about the stuff that fills your life with passion, purpose, and excitement. Let’s take an example from my own life … When I became a professional poker player at the age of 18, I worshiped money. It was everything. I wanted enough money to be safe, and to have freedom in the future. It took me five years to realize that hoarding money wasn’t making me any happier, and that the freedom I was looking for didn’t exist. That was when I jumped into my true passion, which is what I am doing right here. I realized that I could get paid to do what I was interested in, and so can you. Security exists only in our minds. You can amass a fortune, but that doesn’t mean that you are immune to the unpredictability of life. Billionaires feel just as insecure as you and me. They imagine themselves pushing a shopping cart, being alone on the streets … homeless. Anyone can feel bad with that image in mind. It’s not your money, job, or possessions that make you feel safe, it’s your mind. Once you have an idea of where your heart is pulling you, it’s time to take action. And it doesn’t matter if you’re confused, scared, or worried about the future. You either go after the life you truly want, or you don’t. My guidance comes directly from my heart. I often have no idea where to go, but by listening to my heart, and following my excitement, the path becomes clear, even if my mind isn’t. Once you start trusting your heart, it will guide you to the information you need. You may need to go through some tough times in order to accomplish your goals, but if you do, know that they happen for a reason. All of the negativity in my life has turned into a valuable lesson as time has passed. If you wait long enough, it’s impossible to know what is negative and what is positive. The positives turn into negatives, and the negatives into positives. They dance, blend together, and form the adventure that we call life. As you move along your path, notice where you are trying to force your way, and observe where resistance pops up. This can be tough, because it’s hard to distinguish between fear and genuine resistance. For example, when I did my first interview, I was scared, but I knew it was the right thing to do. Your path won’t always be clear, and your heart won’t always be responsive. The reason is usually because you are drowning in your own feelings. You experience what you need to experience. If you’re too rigid with your goals, you will run into resistance and excuses, and you will feel like you are running out of steam. While ups and downs in motivation are to be expected, there comes a point where you run into a wall, which is when you have to be still and listen for the next message from your heart. Adjustment has been my constant companion as I’ve been traveling down the path of making a living doing work I love. It’s all too easy to get caught up in your mind, to start blaming, worrying, and scaring yourself from taking action. I like to stay organized. I like to break big goals into smaller, more bite-sized pieces, but I also like to stay aware of the big picture. This is my process, not yours, but you may want to borrow parts for your own creation. Whatever works for you is what you should do. There are no right and wrongs in goal setting, in life, or in business. We need to start listening to ourselves. For far too long we’ve been slaves to the imaginary rules of others. You are your own teacher. We know what we want, but we are often too afraid to go after it. This post grew from a small piece to something much more than I imagined. It came straight from my heart. Goal setting is something I’m passionate about, because my take on it is radically different from most others out there. That is not to say that my way is the best. There are different options available because different people resonate with different methods. What I like now will change in the future. I accept that. If your goals feel unattainable, use it as a reminder to go inside, and listen to what is going on. We all have something deep down that we want to do, share, or be. And why haven’t you started yet? Thanks for the post Henri. For me personally, indeed I’ve had countless dreams or targets that I fail to achieve, every time the time limit I set for myself runs out. It’s quite frustrating when I can’t even achieve what I plan, it shows how failure I am in planning. For now especially on my blogging, I keep track on my results and performance every month. In fact, I wrote a monthly report based on my monthly performance to keep analysis what am I miss and do wrong, that drag and slow me down. Perhaps my heart is just not strong enough to keep push myself to work harder and greater, in order to achieve all my goals, or I just need to slow a bit down, and get on smaller steps first before the bigger one comes in. You definitely are strong enough. It all depends on how you go about it. Take things easy and one step at a time. Don’t be too hard on yourself. Building a successful blog (or business) takes time. Enjoy the process instead of constantly striving for what you don’t have. But I will keep learning and keep upgrading my blog and myself. So that one I could achieve 5 figures per month and even more. I really like this post man, especially because you mention how wealth is in your mind and not in your bank account. It’s not money that makes you rich but it’s your view of the world and your confidence in your ability to survive and make money no matter what happens. If you have a low self-esteem then all the material wealth in the world is not going to solve your problems. That’s why I really like EFT to overcome the root of the problem and not the symptoms. It always helps to have the basics covered, but even without that, there are happy people all around the world. Start your work in your mind and the rest will follow. A beautiful article. Sending it to my kids to save them hopefully years of angst! Inspiring Henri – thanks! I agree – that goals are all about where we think we want to end up – but that the reality can often be different (better). I particularly liked the bit about ‘adjustment’ that’s key. Me, I just keep putting in the action, and keep going – the Universe will sort out the rest. That’s a good way to go about it, Steve. Just moving forward is something I do a lot, too. Henri! I’ve been a faithful reader for quite a while now and I must say, I really like your stuff. I was happy to see this post but I could have used it a few days ago! I just made a post myself of my life to do list, and all the things you’ve mentioned are exactly why I needed to write it all down. I believe in making it happen! Thanks for the good words here! I like ‘meet a ghost’ on your life to do list. Let me know how that goes! I definitely agree, Henri. The juice is in the journey, versus the end goal. Perhaps, that’s why so many of us feel a let down the day after a big holiday! As I look back upon the most joyous moments in my life, I realize my greatest joys have come while I was traveling the path towards my end goal – taking the journey step by step and being able to watch a creative idea take shape and form. My sacred heart is definitely my most trusted ally along the way, and just as you shared, lets me know how to get back on track whenever I venture off from that which is truly serving me and for my highest and best good. I find it to be so very beneficial for me to take that time to get quiet and go within to listen to the soulful whisperings of my heart. Thank you for the beautiful reminders, Henri! Nothing more needs to be said. Well put, LaTonya! Again another post that resonates with me. You are a fountain of inspiration. I understood when you said that this post came right from your heart. When we write about things that we have experienced it just flows and grows. You are in your own zone, congratulations. I really like how you emphasize the fluidity of goals. I think that’s so important. I’ve found in following my heart and intuition that where I thought I was going is almost never exactly where I end up. And sometimes when I get where I wanted to go, it isn’t what I thought it would be, and I’m disappointed. So, many kudos to you for offering this wisdom to your blog readers. And sometimes when you end up somewhere you didn’t think you wanted to go, you realize that it was much better than where you wanted to go. Life is funny like that. Thanks for stopping by, Jim! I had to smile at this: “just want to lie on the couch, watch movies, and eat chocolate ice cream” That sounds great, except for the chocolate ice cream part; make mine green tea. A recent health scare reminded me that I may never achieve my goals because I probably have a lot less time than I thought. That rocked me more than I like to admit. Thanks for a thoughtful article! One of the traps I fall into when pursuing goals is discounting the reality of the learning curve and understanding that setbacks are part of the process and that the early stages of any new endeavor require experimentation to determine what’s right for you. It’s take a while to sort it all out.